Conceived as a new kind of hotel for Castellón, Hotel Luz is modern, minimalist and located in the new center of the city (behind the central bus and train station and close to the main roads of the city). The Jaime I University and El Corte-Ingles department store are in this area too. The Luz Castellón Hotel has everything you need and much more to offer you. You will enjoy eating in the Aqua Restaurant, where the chef will offer you the new cuisine. 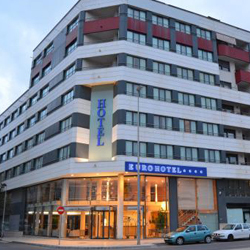 Situated right next to Castellón Bus and Train Station, Eurohotel Castellon offers a gym, sauna and hot tub, a 24-hour reception and bright rooms with free Wi-Fi. Ribalta Park is 400 metres away. Decorated in light colours, each spacious, air-conditioned room offers satellite TV and a minibar with a complimentary bottle of water. Each room has soundproofing and blackout windows. The modern bathrooms include a hairdryer. Eurohotel Castellon has an elegant restaurant, where a varied buffet breakfast is served. There is also a 24-hour bar service on site. Several restaurants and bars can also be found in the surrounding streets. 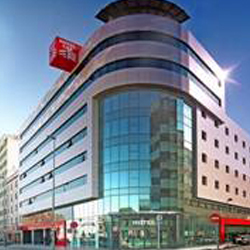 There is a range of shops within a 5-minute walk of the hotel, including a large Corté Inglés department store located 300 metres away. Plaza Mayor Square and Castellon Cathedral are 15-minute walk away. 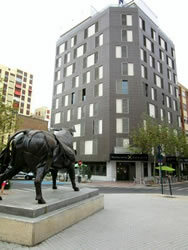 This hotel is beside Ribalta Park, in the center of Castelló, a 10-minute walk from Castelló Train and Bus Station. The modern, air conditioned rooms have free Wi-Fi and hardwood floors. Doña Lola rooms are decorated in warm pale colors and have a TV, safe, sofa and work desk. Modern bathrooms are equipped with a hairdryer. The Doña Lola Hotel restaurant offers great views of the park and serves Mediterranean cuisine. A free daily continental buffet breakfast is served in the breakfast room. There is an El Corte Inglés department store around the corner from the hotel. Castelló Bullring is 300 ft away. The hotel’s central location means it is only a short walk from many shops, bars and restaurants. The Costa Azahar’s beaches are only a 15-minute drive away. Affordable private parking is offered at the hotel.